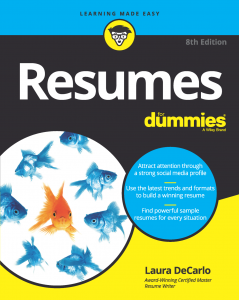 I’m very excited and pleased to announce that Resumes for Dummies, 8th edition is now available for purchase! This new edition is packed with updated content plus new chapters on creating graphic resumes, more resume samples, and a whole chapter of TORI award-winning resumes. Avoid staring at a blank page and get the amazing details that sell you into your resume. Make yourself shine even when you have gaps, too many jobs, or are just starting out from school. Use visual design strategies to take your resume from blah to brilliant using only MS Word. Navigate through sticky areas of ATS, keywords, and scannability. Capture stories and metrics to stand out, even when you feel like it was all just in a day’s work. Understand what’s happening with LinkedIn and job search today. + There are more samples than ever. Remember, recommendations are the lifeblood of any entrepreneur, business, or product. So, if you buy it and like it, please review it! You can purchase or review at https://tinyurl.com/rfd8th. I source expert advice and samples to share a spectrum of possibilities with my readers. I want you to have the best of all worlds when creating your resume(s). So, special thanks goes out to these contributors to the 8th edition, who are listed below. Their contact information can be found in the back of the book. The majority can also be found by last name on the CDI website at https://careerdirectors.com/find-a-career-professional/. Susan Barens – Golden Ratio Ltd.
Maria Caraballo – Career Branding Inc.
Ken Docherty – Docherty Career Management, Inc.
Maureen Farmer – Word Right Career and HR Consulting Inc.
Erin Kennedy – Professional Resume Services, Inc.
Marie Plett -Aspirations Career Services, Inc.